AVILA BEACH, Calif. — (November 15, 2015) — On a cool fall Sunday morning with scattered showers, at the 2nd Giro Della Costa Centrale presented by VisitAvilaBeach.com, Cory Lockwood, 27, of Tehachapi, CA and Jane Despas, 50, of Menlo Park, CA won the SLO GranFondo 100 Mile race in 4 hours, 44 minutes, 30 seconds and 5:00:41, respectively. Despas of ICE Sportswear p/b Pinnacle Racing defended her crown, while men’s defending champion Blake Anton of Team Clif Bar finished third. The annual cycling event, produced by Race SLO, started and finished at Avila Beach and featured four timed routes ranging from 25 miles to 100 miles along the scenic Central Coast. “Great event, it was run like a USA Cycling event, very professional. It was my first time riding out here and I got to see everything: the countryside, the ocean, it was great,” said Lockwood. 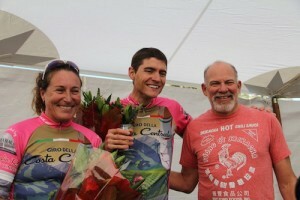 In the SLO GranFondo, as first rider to the top of Perfume Canyon, Lockwood and Sara Bird were also crowned King & Queen of the Mountain (KOM), clocking 19:29 and 24:15 respectively, and each earned the coveted polka dot jersey. USL.TV also streamed live the Giro Della Costa Centrale at usl.tv/giro-della-costa-centrale/ with cameras at the start & finish, King of the Mountain (KOM) time trial on the SLO GranFondo course as well as a live camera along the waterfront as riders took in the magnificent Morro Bay to Cayucos region. The day before in Avila Beach at Custom House Wine Cellar, there was a lively, engaging sold-out Pro Panel moderated by USA Cycling Chairman Bob Stapleton and featuring author, commentator and former professional Bob “Bobke” Roll and 2012 London Olympics silver medal cyclist Dotsie Bausch . Earlier on Saturday morning, Roll also led an informal coffee ride with more than 40 cyclists. This year’s Giro had an event record 1,000-plus registered riders overall and benefited the Hearst Cancer Resource Center and SLO A.L.P.H.A. The 2nd Giro Della Costa Centrale presented by VisitAvilaBeach.com, November 14–15, 2015 in Avila Beach, Calif., had four timed new routes ranging from 25 miles to 100 miles that showcased the beautiful Tuscan-like California Central Coast plus a first class recovery area that included a 5-star chef’s hot Italian lunch, massage, wine and music at Festivale Italiano. Established in 2010 to bring world class sporting events to the California Central Coast, the Race SLO family of annual events includes the Cancer Challenge 1 Mile, 5K & 10K (September 6, 2015), Giro Della Costa Centrale cycling event (November 14–15, 2015), SLO Marathon + Half and Family Fitness 5K (April 30-May 1, 2016) and the inaugural SLO Ultra trail race at Wild Cherry Canyon (September 10, 2016). Come experience the best the California Central Coast has to offer: year-round sunshine, rolling green hills, unspoiled open roads, first class finish lines and more. Come Race SLO: #SmallTownBigRaces!